CARMEL, Calif. (Oct. 27, 2018) – Coming into Saturday’s final round of the Stocker Cup, 12 players were within five shots of the lead and all eyes were on the title. On a particularly challenging final day, where just ten players shot under par, John Sawin of Pebble Beach came from behind to hoist the Cup. Despite a new role as Vice President and Director of Golf at Pebble Beach, Sawin hasn’t lost his game. He carded a 5-under 67—putting him at 9 under for the event, one clear of second place. Despite a pair of bogeys on the front nine, he put together five birdies and an eagle to capture the low round of the day—not to mention a great scorecard for him and partner Steve John in team play. It was a little bit of déjà vu out there for the past champion as he battled his way back from a rocky start. Three players came up just one shot short of Sawin, including Jonas Mikals of Truckee, Calif., Derek Meinhart of Mattoon, Ill., and second-round leader Brian Blanchard of Scottsdale, Ariz. Mikals carded a final-round, 4-under 68, Meinhart shot 2-under 70 and Blanchard finished with a 71. Rounding out the top five was G. Davis Boland of Glenview, Ky., who put together an impressive final-round 69. 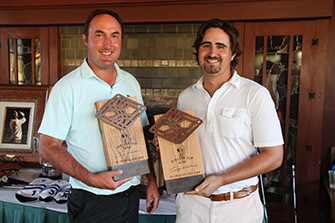 In the team competition, second-round leaders Brian Blanchard and partner Daniel Licursi of Chandler, Ariz., put together yet another impressive round of 8-under 64 to win the gross division by four shots at 23 under par. 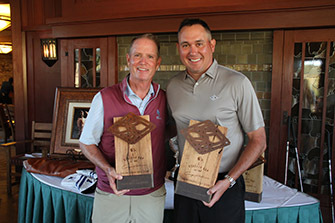 Behind Blanchard and Licursi, the now two-time Stocker Cup winner John Sawin and partner Steve John were second after a final-round 64 brought them to a tournament total of 19 under par. In third place was Jason and Jack Anthony, the father-son duo from Fairfield, Calif. They carded a second consecutive round of 5-under 67 to finish at 17 under for the event. In the team Net division, Derek Meinhart and partner Alan Dunckel of Monterey, Calif., finished with a commanding four-shot victory at 27-under par. They were ahead of Blanchard and Licursi in second. Behind them, a group of seven teams tied for third after finishing at 20 under par for the event. Players over the age of 50 all compete for the Sandy Tatum Trophy, named after Northern California golf legend Sandy Tatum, who was a design consultant for The Preserve Golf Club and member of the Stocker Cup Tournament Committee before his passing last year. This year’s winner was Roger Newsom of Virginia Beach, Va. with rounds of 71-70-72 to finish the event in a tie for 8th at 3-under par. He finished two shots ahead of William Mitchell of Atlanta, Ga., who finished solo 12th at 1-under-par 215 for the tournament. Michael Rowley of San Luis Obispo, Calif. was the third low 50+ player, finishing tied for 17th at 2-over 218. 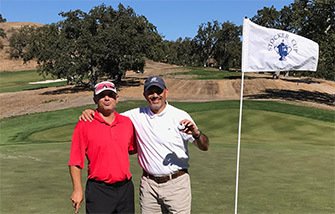 Long-time Stocker Cup participant and tournament supporter Sam Nunes had the shot of the day on Saturday, with an ace at the 6th hole. It was his first ever hole-in-one, and what a place to get it! Nunes, a 7 handicapper from Oakland, was the B player partner of Adam Walicki of Phoenix, Ariz., and helped Walicki by 19 shots over the course of the tournament. 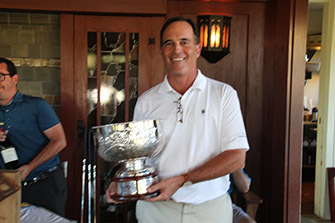 The Stocker Cup was founded in 1991 to honor the memory of Peter Stocker. Peter and his partners Bill Harlan and John Montgomery founded San Francisco's Pacific Union Company, a highly successful real estate development company. The firm initiated the development of The Santa Lucia Preserve, a 20,000 acre residential and golf community located above Carmel. Meandering through the winding road to The Preserve's centerpiece -- the top-100 rated golf course -- has been described as "driving through a California postcard." The Stocker Cup was played from 1991 to 1999 at Pebble Beach and its surrounding golf courses, before moving to the Tom Fazio and Sandy Tatum designed Preserve G.C. In the words of former USGA President Tatum: "Peter Stocker was the quintessential amateur golfer. He loved golf with a passion. He would have loved this tournament." 54-hole individual competition with a simultaneous best-ball event, similar to the AT&T Pebble Beach Pro-Am. Invited Mid- Amateur players are either paired with a single digit amateur or can propose their own partner to be introduced and invited by the Committee.